↑ Stephen, Martin (1988), Volume 2: Sea Battles in Close Up World War 2, Naval Institute Press, p. 53, ISBN 1557507589, One way of dealing with Malta would have been an airborne invasion but Hitler would not countenance such a thing, especially after the pyrrhic casualties of the Crete victory. ↑ Quarrie, Bruce; Anderson, Duncan (2004), German airborne divisions: Blitzkrieg 1940-1941, Osprey, p. 98, ISBN 1841765716, ...from the historic raid on the Belgian fortress of Eben Emael to the pyrrhic victory over British and Commonwealth forces on the island of Crete. ↑ Tillman, Barrett (2004), Brassey's D-Day encyclopedia: the Normandy invasion A-Z, Brassey's, p. 1, ISBN 1574887602, The Luftwaffe also made history in the first aerial occupation of an island – the costly Crete operation in 1941. However, Germany's Pyrrhic victory proved so costly that no Fallschirmjaeger division was again involved in a major airborne operation. ↑ Winchester, Charles (2007), Hitler's War on Russia, Osprey, p. 24, ISBN 1846031958, The airborne invasion of Crete had been a pyrrhic victory for the Luftwaffe, with the effective destruction of its elite 7th Airborne Division. ↑ Coggins, Edward (2000), Wings That Stay on, Turner Publishing Company, p. 65, ISBN 1563115689, It was a pyrrhic victory and the death of major German airborne operations for the rest of the war. ↑ Hinsley, Francis; Stripp, Alan (2001), Codebreakers: the inside story of Bletchley Park, Oxford University Press, p. 3, ISBN 0192801325, In May the decryption in good time of full details of the German plan of attack did not enable the defenders to save Crete, but it enabled them to turn Germany's victory into a Pyrrhic victory. ↑ Buell, Thomas; Greiss, Thomas (2002), The Second World War: Europe and the Mediterranean, Square One Publishers, p. 101, ISBN 0757001602, The rank and file on both sides fought tenaciously on Crete, and in the end the Germans could claim only a pyrrhic victory. ↑ Wright, Robert; Greenwood, John (2007), Airborne forces at war, Naval Institute Press, p. 9, ISBN 1591140285, The seizure of Crete was a strategic but Pyrrhic victory for Germany that was brought at the price of future German airborne operations. ↑ Axelrod, Alan (2008), The Real History of World War II: A new look at the past, Sterling Publishing Company, p. 175, ISBN 1402740905, These losses stunned Hitler, who deemed the battle of Crete a Pyrrhic victory and personally forbade airborne assaults for the rest of the war. ↑ Davin, Daniel Marcus (1953). "Appendix V — CASUALTIES". Crete. The Official History of New Zealand in the Second World War 1939–1945. Wellington, New Zealand: Historical Publications Branch, Department of Internal Affairs, Government of New Zealand. pp. 486–488. ↑ Maloney, Shane (July 2006). "Bogin, Hopit". The Monthly. Axelrod, Alan (2008). The Real History of World War II: A New Look at the Past. Sterling Publishing Company Inc. ISBN 1402740905. Badsey, Stephen (2000). The Hutchinson Atlas of World War II Battle Plans: Before and After. Taylor & Francis. ISBN 1579582656. Beevor, Antony (1992). 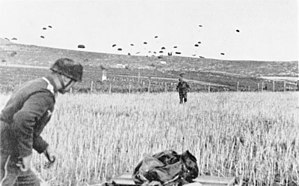 Crete: The Battle and the Resistance. Penguin Books. ISBN 0-14-016787-0. Churchill, Winston Spencer (1985). The Second World War Volume III. Houghton Mifflin Harcourt. ISBN 0395410576. Davin, Daniel Marcus (1953). Crete. The Official History of New Zealand in the Second World War 1939–1945. Wellington, New Zealand: Historical Publications Branch, Department of Internal Affairs, Government of New Zealand. Hellenic Army General Staff (1997). An Abridged History of the Greek-Italian and Greek-German War, 1940-1941 (Land Operations). Athens: Army History Directorate Editions. ISBN [[Special:BookSources/960-7897-01-3 OCLC 45409635|960-7897-01-3 [[Online Computer Library Center|OCLC]]&nbsp;[http://www.worldcat.org/oclc/45409635 45409635]]] Check |isbn= value: invalid character (help). Long, Gavin (1953). Greece, Crete and Syria. Australia in the War of 1939-1945 – Series One (Army). Canberra: Australian War Memorial. Mooorehead, Alan, Mediterranean Front, London, 1941. Saunders, Hilary St. George (1959) . The Green Beret: The Commandos at War. London: Four Square Books. หน้านี้แก้ไขล่าสุดเมื่อวันที่ 11 เมษายน 2562 เวลา 04:10 น.